There’s no question effective training saves lives, and inadequate training can cost lives. In a ruling last month following a front-end loader accident at a Nebraska asphalt facility, OSHA cited the company’s failure to have someone properly trained to administer first aid as a contributing factor in the death of a 35-year-old man. Supervisors who are responsible for training employees should have adequate training themselves. As the safety manager, you’re responsible for ensuring all individuals have the knowledge they need to do their jobs safely and effectively. Here are five easy ways to sharpen your training tactics without spending a lot of money. People learn in different ways. Some are more receptive to information they see, while others need to hear something several times to absorb it. Others learn best through on-the-job experience under supervision. Blended learning ensures all your employees get the most from their training by delivering the information to them in several ways. A University of Tennessee study showed a blended learning program reduced both the time and cost of training by more than 50 percent and resulted in learning outcomes that were 10 percent better than traditional methods. Your training program should use a combination of tutorials employees can take at their own pace, as well as opportunities for interaction in a classroom or at the job site. Computer-based training can save significant time and money. When it includes a combination of text, graphics, sound and video animation, it can significantly improve retention. Computer-based training does have its limitations, however, so it’s most effective when used along with hands-on training. The bottom line: Training is most successful when it presents information in multiple formats and closely replicates the task employees will be performing. Take time to review your training programs and make sure they take into account the various learning styles of your workforce. The OSHA confined spaces training course lasts two hours, so that’s quite a bit of information to digest. When employees understand exactly what they’re expected to know, they’ll be able to focus their attention accordingly. Don’t assume your employees have absorbed the material just because it’s presented well. Check their understanding by asking questions throughout the training or having them complete a short quiz at the end of each section. Computer-based training modules often have quiz questions built in, but you can easily add them to your presentations. You can do this during a classroom session or have it built into a computer-based training module. An integrated safety database allows you to create your own safety training modules, upload existing training content or link to those materials. You can define the objectives, build in quizzes and maintain records of all employees who successfully complete your training. Offer resources employees can easily access after training. Studies show up to 90 percent of spoken information is forgotten within 24 hours, so it’s important to reinforce it with written materials. Handouts can be helpful, but all too often, they’re tossed aside or forgotten in a heap of papers. Moving your training manuals to an online database makes it easier for employees to find information as it’s needed. You can upload and edit existing manuals or create new ones. The information you offer should be in a format that’s easy to read, using bullet points and including supporting illustrations whenever possible. Training, like learning, is a lifelong process. Even employees with decades of experience can open themselves up to error when they become too comfortable with a particular task. No job is routine. 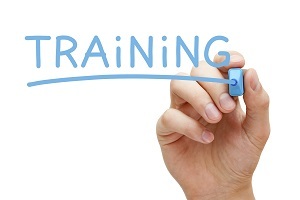 Involving longtime employees in the process of training others can keep their skills sharp. Your company should conduct regular safety audits to monitor employees on the job and coach them as needed. Safety audits can be programmed into a safety database so they’ll occur at a regular frequency with reminders sent to the individuals conducting them. Effective training enables employees to work safely and efficiently, ultimately reducing lost time and workers’ compensation costs. The BasicSafe integrated safety software system gives you the tools you need to stay on top of your training. You can use it to set up educational modules, manage scheduling and maintain records of completed training. BasicSafe is designed to handle the administrative side of training so you can focus on educating your employees. To learn more about the BasicSafe Training Management Module, click here.